Hani and Munira Amer still live with 2 of their as yet unmarried children in the home they made for their family in Mas’ha after being driven off their ancestral in al Nakba. They lived here in relative peace until an illegal settlement was built in their backyard and Israel plotted the Apartheid wall and the Amer home was in its path. While they won the battle against their home being demolished to make way for the Wall, they lost the right for any semblance of normal life. 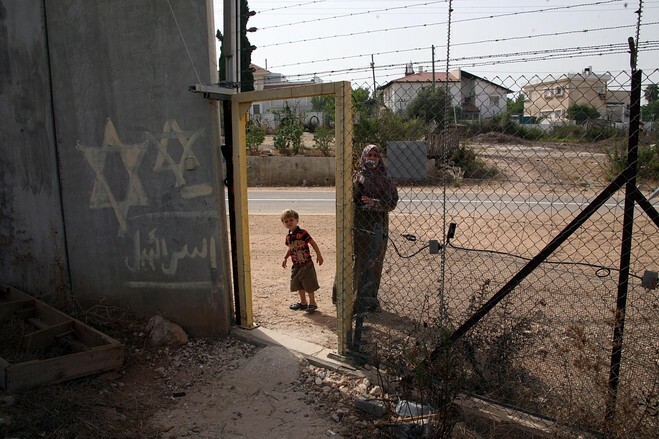 Their home is surrounded by Israel’s Apartheid Wall and a maze of fences and gates on three sides and a hostile illegal Israeli settlement abutting their backyard. Everything outside the house reminds one of the yard of a high security prison. Many international organisations have written about this unique story of forced isolation. IWPS has published several reports, 2007 http://iwps.info/files/2011/04/Report-from-Masha.pdf, and 2010 http://iwps.info/files/2011/04/Back-to-Masha.pdf and an news report 2014 http://iwps.info/2014/06/masha-apartheid-wall/. Hani and Munira still welcome internationals to visit their family and bear witness to the unfathomable isolation Israel has imposed on their home by the Apartheid Wall. They say that international visitors gives them hope for the future. 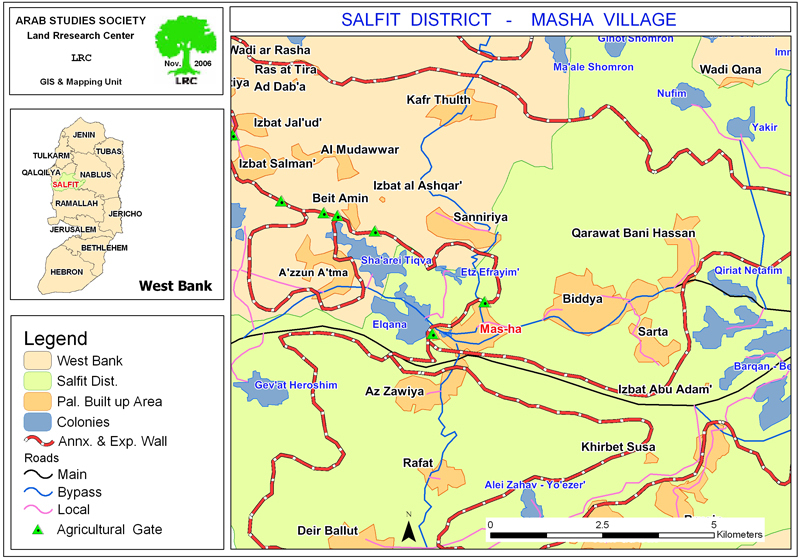 Also, visitors, while present, protect them from harassment by the Israel occupation forces and neighboring settlers. After the Wall was built in 2005, a single locked gate was and continues to be the only means for family and visitors to access the Amer home. For two years, the Occupying forces had the only key. The children often missed school after waiting for hours in inclement weather for the soldiers to allow them access to the world outside their imprisoned home. In 2007, Munira was given a single key. Understandably, visitors are few. Friends and family are uncomfortable in the tiny yet hideously militarized prison home. Indeed, the Amer’s never feel entirely comfortable in their own home. Soldiers intimidate them. Once they held a gun to Hani’s neck. The settlers threaten. They have thrown stones and other debris on the Amer’s roof and yard, damaging water tanks and solar panels. IWPS has spent nights with Munira and the children when the settlers were particularly intimidating and Hani was away. The intimidation has lessened, though the tension is still palatable. On October 25, 2015, four IWPS volunteers and long time mutual friend of IWPS and the Amer’s made a visit to the family. They met only with Hani. He said that “nothing has changed and that is a victory for them.” But he also said that he and his family had to pay high price for it. The Amer’s family is not only isolated from the village of Mas’ha but also separated from their children as they marry. They can’t live together in the same home with their married children and their families. In Palestine, one of the children, usually the oldest son, or another, would build another (second) floor above the parents’ house and live with them. The Amer’s family cannot get a permit to expand their home for their children who have married. The Amer home is very small and as their children marry and begin their families, they move into Mas’ha, on the other side of that 8 meter high wall and maze of fences and a gate with one key. As Hani and Murnira age, they suffer health issues. They need the support and assistance of their children. They wish they had a second floor on their home where their children and grandchildren would live, as is customary for Palestinian families. But there is no second floor and never will be as long as Israeli . Hani petitioned for a permit to build two extra rooms onto his home. His request was denied; the reason given was the land was classified as agricultural and . The answer was NO because his house stood on agricultural land and buildings were to be demolished! At the same time settler´s were allowed to build 30 meters away. 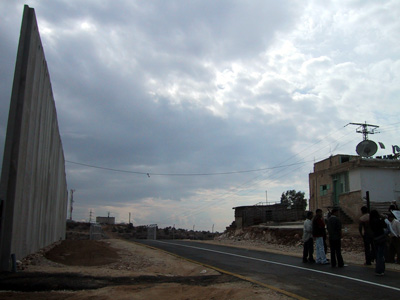 The Apartheid wall and the maze of fences have taken a big part of the land, and a new settler only road is under construction next to their home. Yet they are steadfast in their determination to hold onto their what they have. Munira has her own cottage industry, making soap, oil and handcrafted embroidery. They are treasures for us internationals! However, Munira is is too modest to invite people to see her handiwork. One has to ask, and please do! What she earns is an important contribution to their household income. It is very difficult to for Hani to work outside the home. He and Munira must keep a vigilant guard over the guards of their home.